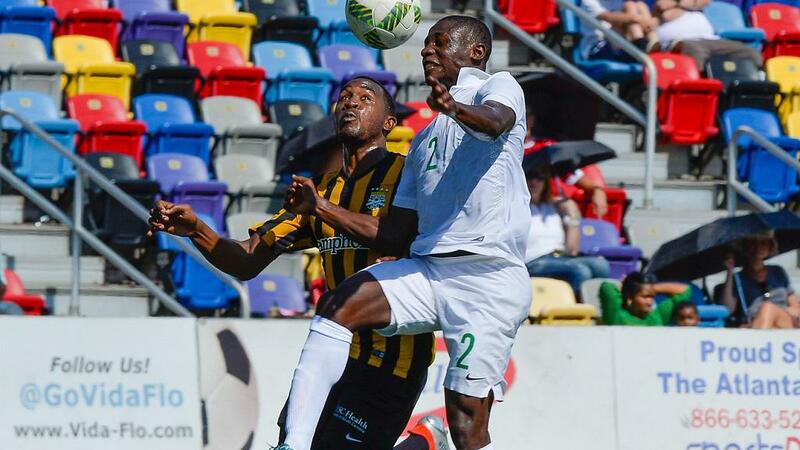 ATLANTA – The Charleston Battery took a break from league play take on Nigeria’s Olympic National Team and dropped a 1-0 decision on Sunday morning at Silverbacks Park. The match originally was to be held Saturday night, but heavy rain flooded the field and it was postponed until the following day. Charleston faced a Nigeria side that booked its ticket to the 2016 Olympics in Rio de Janeiro coming up in August after beating Senegal in the CAF Africa U-23 Cup of Nations semifinals. The opening half was all on goalkeeper Alex Tambakis with multiple saves to keep Nigeria off the score sheet, first with a tip over the bar in the 20th minute and then a stop at point-blank range nine minutes later. Nigeria eventually struck off the foot of 20-year-old defender Stanley Amuzie in the 33rd minute to take a 1-0 lead. Nigeria held control of the match as Charleston did not generate its first shot until the 38th minute from 18-year-old Ghanaian striker Jeffrey Otoo. Charleston made a number of subs throughout to give its roster minutes. Odisnel Cooper replaced Tambakis for the start of the second half and then gave way to Robert Beebe for the final 15 minutes. In one block of subs, Atlanta United Academy players Lagos Kunga, Cole Gulledge and Chris Goslin saw second-half action. Kunga, who formerly played for the DDYSC Wolves in the Super Y League, took part in the inaugural USL Experience in Cincinnati earlier this year. The closest Charleston came to a goal was in first-half stoppage time when forward Chris Tsonis had a goal waved off. Charleston returns to league play on Saturday, going on the road to face the New York Red Bulls II.